eucharistandmission: The next time you read in some interview a Curia cardinal or archbishop at the Vatican saying that Vatican Council II is in harmony with Tradition, he is not interpreting magisterial documents with Feeneyism. Instead it is deception. The next time you read in some interview a Curia cardinal or archbishop at the Vatican saying that Vatican Council II is in harmony with Tradition, he is not interpreting magisterial documents with Feeneyism. Instead it is deception. Nothing controversial here.This is something obvious. But Archbishop Guido Pozzo and Archbishop Augustine Di Noi will hide this information and block the Franciscans of the Immaculate and Society of St. Pius X(SSPX) from announcing this. Cardinal Ladaria denied this information on March 1, 2018. He suggested LG 8 refers to a visible and known non Catholic saved outside the Church.So there was no more exclusive salvation in the Catholic Church he told the reporter of the Associated Press.This was at the Placuit Deo press conference. So Pozzo and Di Noia know what the boss, their employer wants. They also know what the Left wants. In one of his many interviews, in which written questions are answered, Archbishop Guido Pozzo appealed to the SSPX to accept Vatican Council II since the Council was in harmony with Tradition for him. This was false. He was openly telling a lie. If he would be asked if he affirms the strict interpretation of the dogma extra ecclesiam nulla salus( EENS), he would deny it. 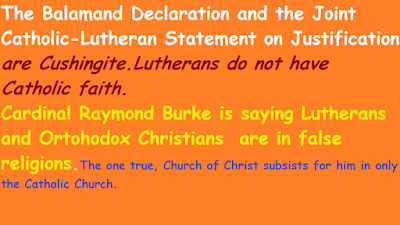 If he was asked if he affirmed the Syllabus of Errors on ecumenism, he would deny it. 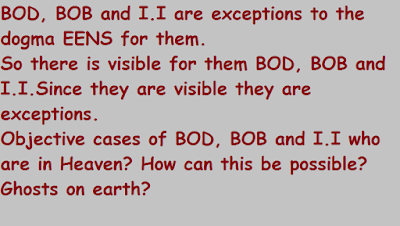 If he was asked if he interprets all the Catechisms with BOD, BOB and I.I as referring to invisible and not visible people, he would say 'visible people', otherwise how else could there be exceptions to Feeneyite EENS and the Syllabus of Errors on an ecumenism of return only. So he was telling a lie in that interview.His hidden agenda is to get the SSPX (like the FSSP,SBC and other traditionalists) to affirm Vatican Council II (Cushingite) and not Vatican Council II ( Feeneyite).So there is a rupture with EENS, Syllabus of Errors etc. 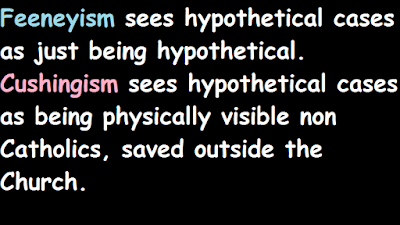 He knows that I am not offering any new theology and so neither am I putting forward any new doctrine. 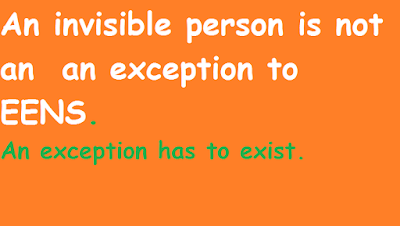 All I am saying is that invisible people are not visible, hypothetical cases of BOD, BOB and I.I and LG 8, LG 14, LG 16 , UR 3 etc are not practical exceptions to EENS, they are not seen in the flesh cases in 2018 of people saved outside the Church.So they cannot be objective exceptions to EENS. I am making an empirical observation and Ecclesia Dei and the CDF cannot comment. 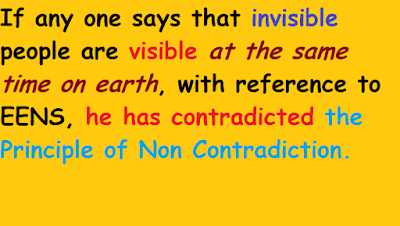 I am referring to something obvious and what is common knowledge and yet they cannot agree with me in public. I repeat Archbishop Pozzo wanted the SSPX to accept Vatican Council II with Cushingism and so the Council would be a rupture with the dogma EENS ( Feeneyite), the Syllabus of Errors and the past ecclesiology. Pope Benedict and Archbishop Pozzo would not affirm Vatican Council II ( Feeneyite) in public since it would be in harmony with EENS( Feeneyite) and the past exclusivist ecclesiology of the Church. This would not be appreciated by the present two popes and the Jewish Left. Similarly Pope Benedict was a liberal when in March 2016 (Avvenire) he said that EENS today was no more like it was for the missionaries in the 16th century. He said that there was 'a development' with Vatican Council II. He meant Vatican Council II (Cushingite).This is also 'a development' for Cardinal Ladaria and Archbishops Pozzo and Di Noia. 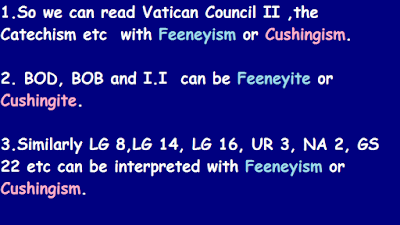 Pope Benedict was not going to affirm Vatican Council II ( Feeneyite ) which would not be a rupture with EENS( Feeneyite). How could he affirm EENS ( Feeneyite) ? The Jewish Left would object. Since he interpreted Vatican Council II and EENS with Cushingism, he asked in the Avvenire announcement(interview) for the Left, if Vatican Council II ended the need for mission. Not for me.Since I interpret Vatican Council II with Feeneyism and dogmas do not change. The dogma EENS has not changed for me. It has not be made obsolete with Vatican Council II ( F) for me. 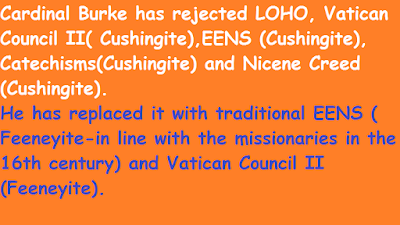 So Archbishops Pozzo and Di Noia would know what I am saying on this blog and for political reasons not be able to accept it.In this sense they do not want a reconciliation with the Franciscans of the Immaculate and the SSPX.Since the Vatican does not want 'to come back to the faith'. Like at Ecclesia Dei, Cardinal Braz de Avez has announced that he wants the Franciscans of Immaculate to accept Vatican Council II. 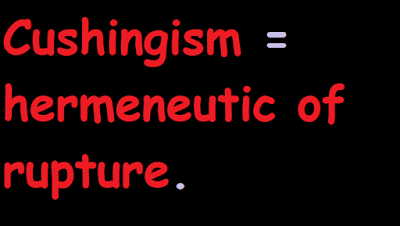 He meant Vatican Council II (Cushingite). 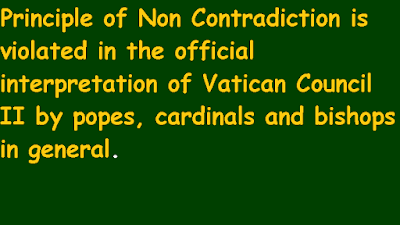 Similarly Archbishop Jose Carbello has said that the comtemplative communities must accept Vatican Council II and he was not referring to Vatican Council II( Feeneyite). 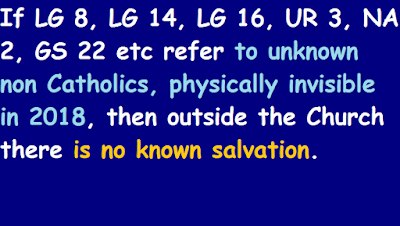 LG 8(subsists it in/elements of sanctification and truth), LG 14( case of the unknown catechumen who dies before receiving the baptism of water and is allegedly known and saved), LG 16( case of the unknown/known non Catholic saved outside the Church in invincible ignorance), UR 3( case of the Christian, non Catholic, saved in imperfect communion.He is known or unknown, depending upon your point of view or ideology), NA 2 ( unknown/ known non Catholic saved because of that ray of Truth, or because of good and holy things in other religions), GS 22( non Catholics men and women of good will who are known/ unknown and are saved outside the Catholic Church i.e without the baptism of water and Catholic faith). BOD( baptism of desire), BOB ( baptism of blood) and I.I ( invincible ignorance). There is an in principle error in the Vatican Council II text : Does the SSPX have to accept it for canonical status? 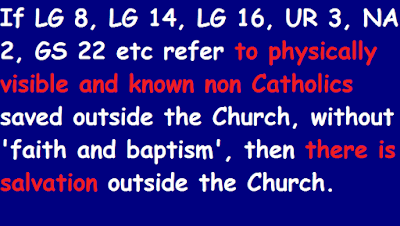 Cardinal Braz de Avez, Archbishops Carbello, Pozzo,Di Noia and the media Reuters, Associated Press, La Stampa could clarify if they are referring to Vatican Council II interpreted with LG 16 being visible or invisible since either way the interpretation of the Council II changes.